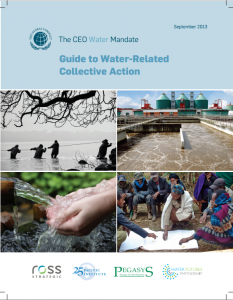 The UN Global Compact’s CEO Water Mandate initiative has released the Guide to Water-Related Collective Action, which provides a step-by-step approach to water-resource-related collective action. The Guide, finalized after a year of testing and research on a beta version, helps businesses develop strategy focused on effective, sustainable, and equitable external engagements related to water. The Guide to Water-Related Collective Action can be used in conjunction with the CEO Water Mandate’s Water Action Hub, the world’s first on-line platform to unite companies, governments, NGOs, and other stakeholders on a range of critical water projects in specific river basins around the planet.